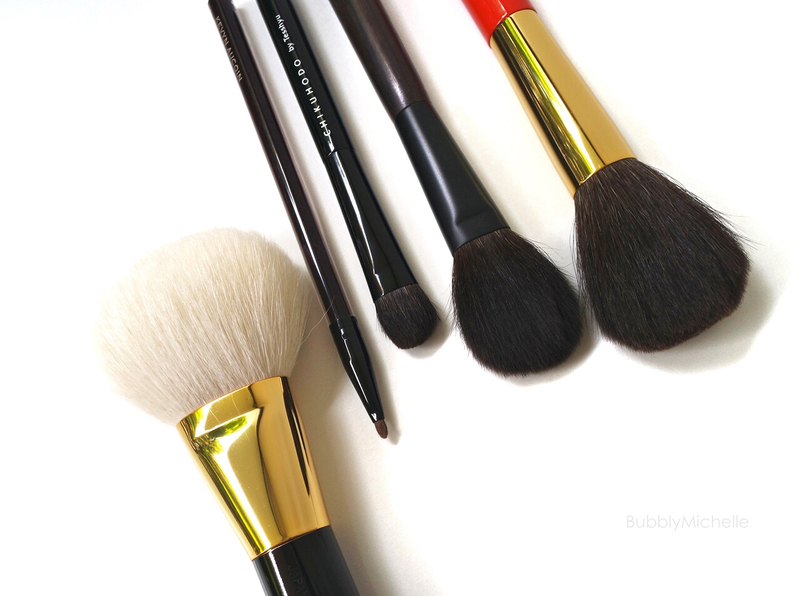 Todays post is all about brushes! My Top 10. They are a well edited bunch of eye and face brushes that I REALLY enjoy and use practically every day. Therefore I’m certain you’d end up loving them too! So before we get to todays post, confession time. There aren’t 10 brushes here. As I started out picking my favourites, I could only manage gathering nine! It wouldn’t have been fair to speak about 9 favourites and add one extra brush I just don’t feel comfortable recommending as a TOP FAVOURITE!. 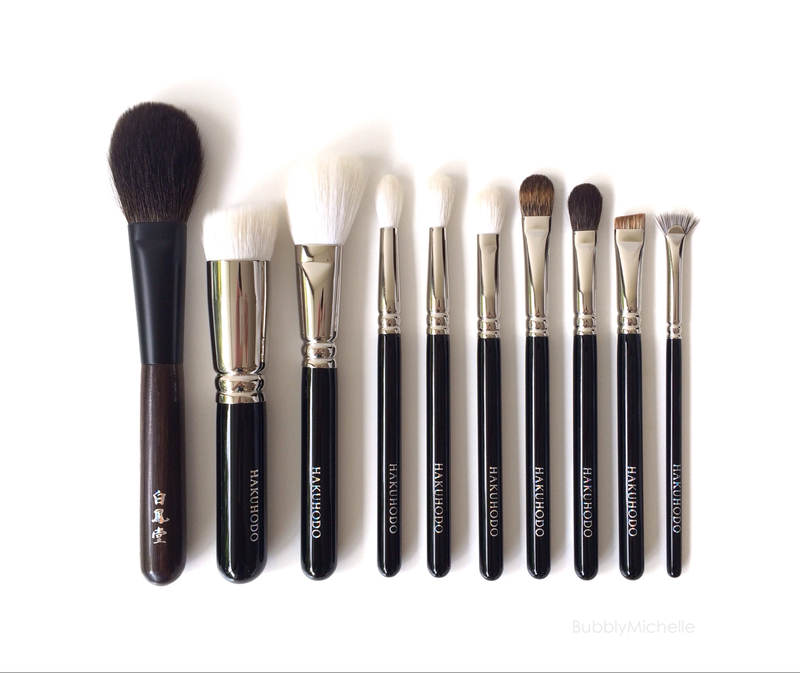 So I figured I’ll keep it real and share a post about my top 9 brushes instead! First up, here’s a look at the poor souls to be judged based on looks, size and performance. Hakuhodo J4006, Hakuhodo J5523, Hakuhodo J125, Tom Ford Eyeliner & Definer Brush 15, Wayne Goss 05, Hakuhodo J004G, Kevyn Aucoin Concealer Brush, Tom Ford 05 Bronzer Brush, Wayne Goss 02. 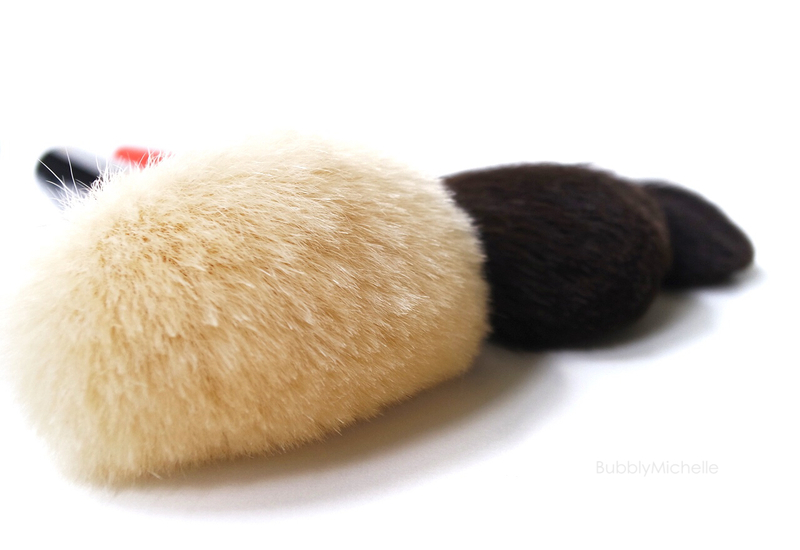 Is a plush, goat hair brush. One of the oldest brushes in my current collection (4yrs or so). The bristles are soft and densely packed enabling it to hold it’s shape well and allow maximum control. The handle is a chubby wooden lacquered one to match the voluminous brush head and gives it good balance. The overall quality of this brush is exceptional. The gold lettering hasn’t rubbed off, the handle has never chipped (even after dropping it many a time) and the golden ferrule has never lost it’s shine. I’m happy that it lasted so well over time and is money well spent. 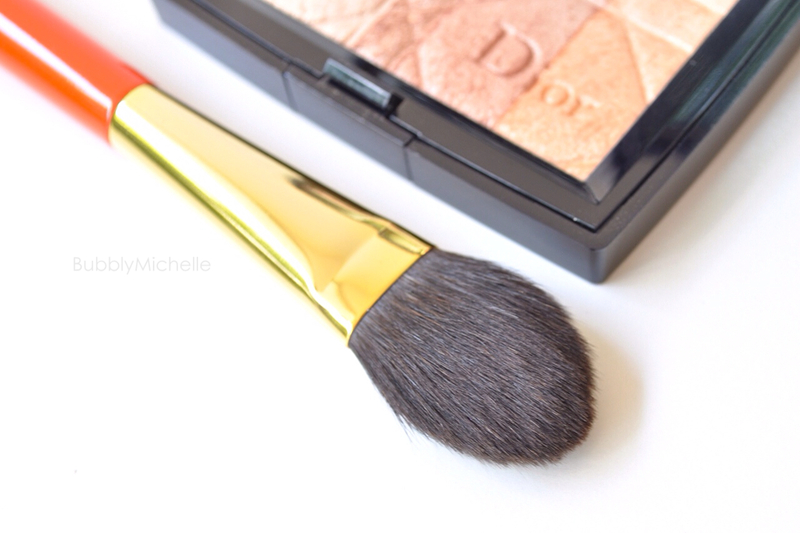 This brush applies bronzer twice as fast as any other brush I’ve tried. Mostly due to it’s size as it covers a large area one go. 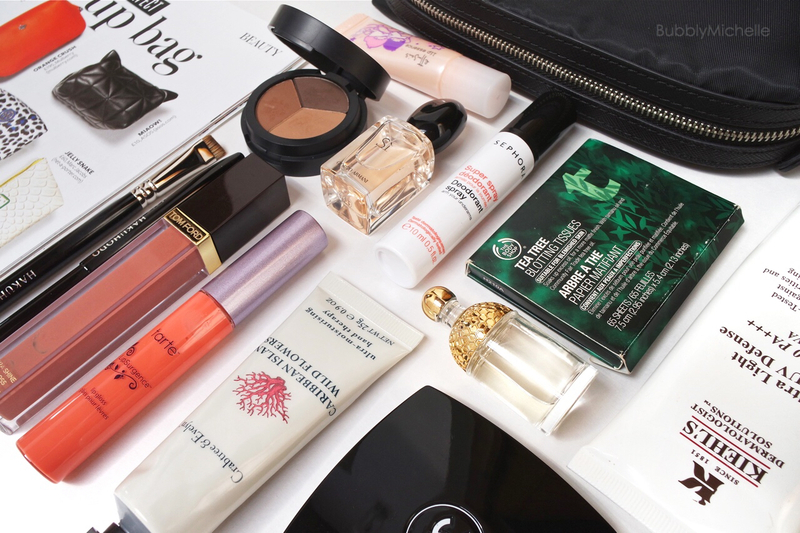 It also picks up just the right amount of product and applies it seamlessly without any harsh lines or patchiness so I don’t have to spend time blending. My method of application is holding it close to the furrule and buff in circular motions to achieve a perfect finish every time. I try to wash my brushes at least every two weeks. And so far I’ve never experienced any shedding from the Tom fords. They also never stain and after every wash look as good as new! 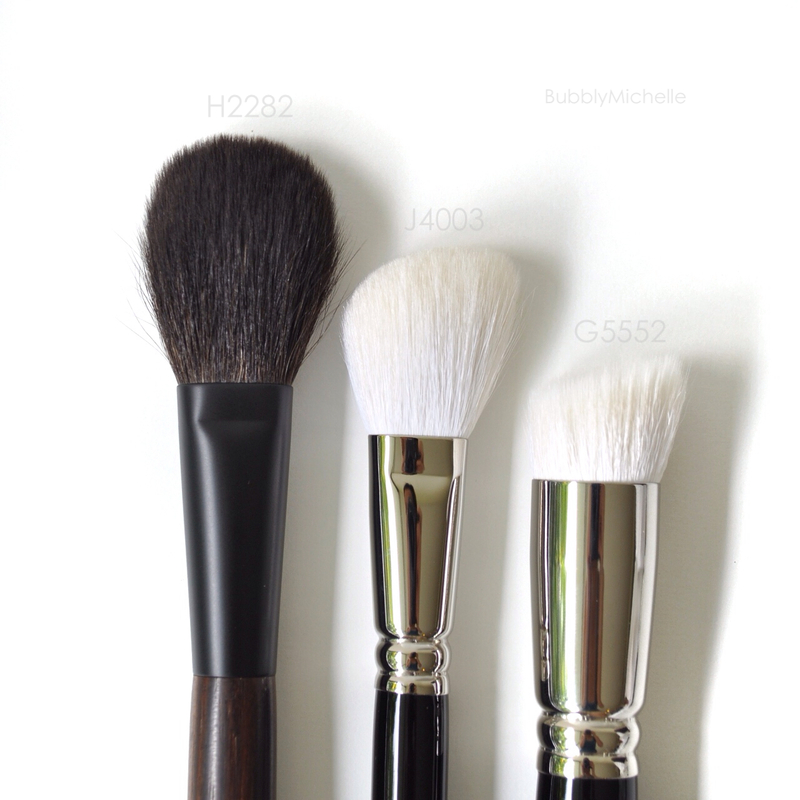 Additional info – The bristles of most of the TF brushes are Goat Hair and are a natural off white, which means the goat hair has never been dyed. Usually I notice brushes with dyed hair smell strange when being washed (my Hakuhodo powder brush being the perfect example) and also has a slight colour bleed. Is a small tapered face brush. It’s described as a natural bristled brush (with uncut hairs for maximum softness). The bristles are indeed soft and I believe the size and shape of this brush makes it quite versatile. The moderately packed bristles enable just the right amount of give for applying powder products with ease. 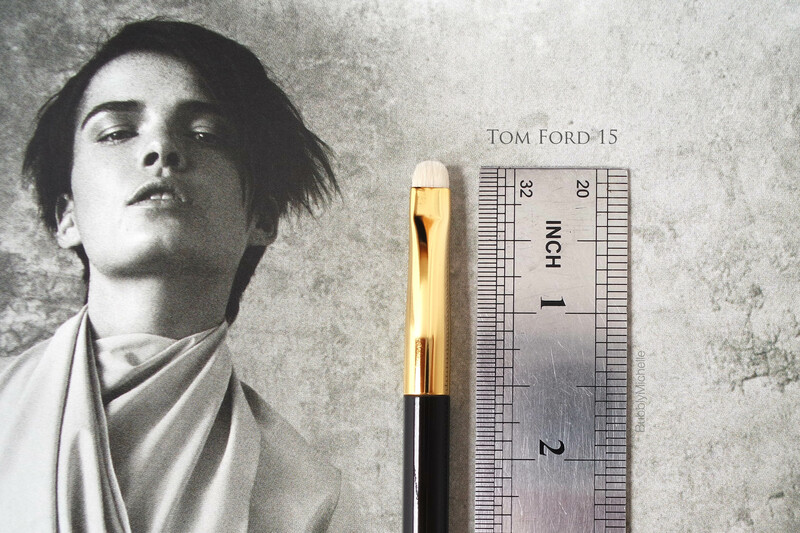 In comparison to the Tom Ford brushes, the handle of this is much much lighter. But overall I believe it suits the brush well and is perfectly balanced and comfortable to hold. 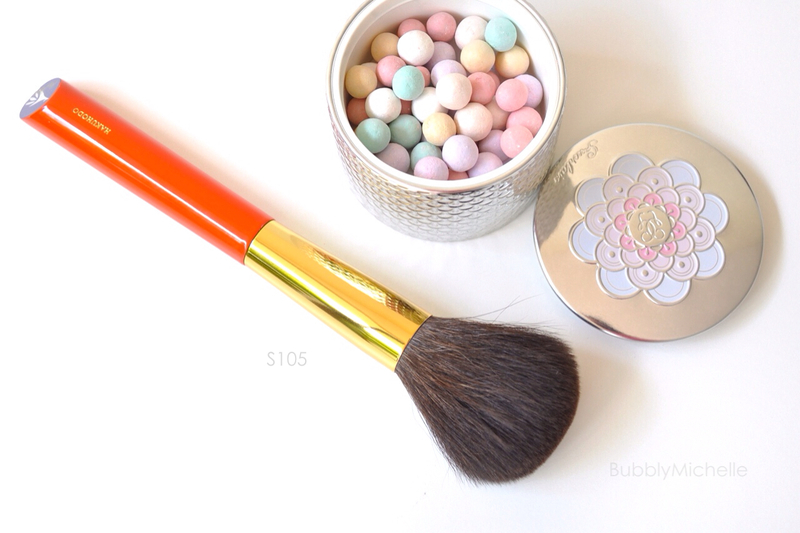 According to online description, it’s a brush which can be used for bronzing, blusher or highlighter. Personally I feel the shape is too tapered for blush or bronzer. But ideal for placing a perfectly diffused highlight or powdering areas that are harder to reach with a regular brush, such as the inner corner of the eyes, under eyes as well as the sides of the nose. 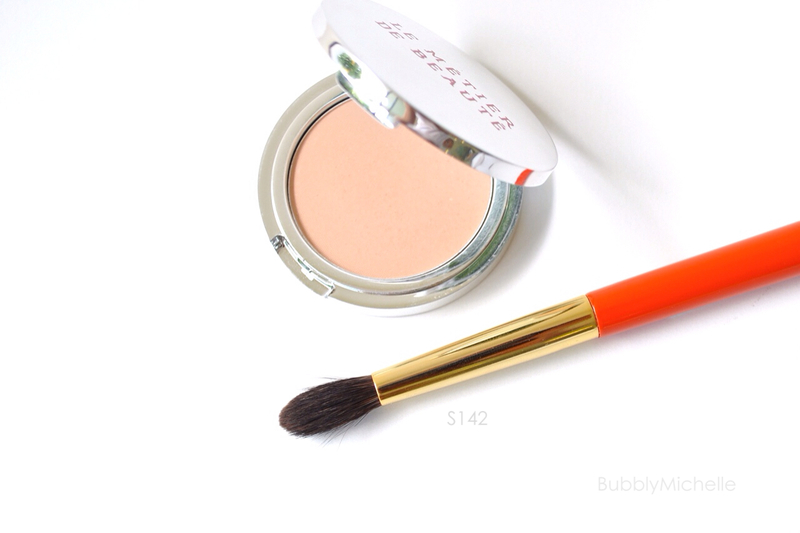 I mainly use it as a powder brush for setting concealer as it fits the undereye area perfectly. 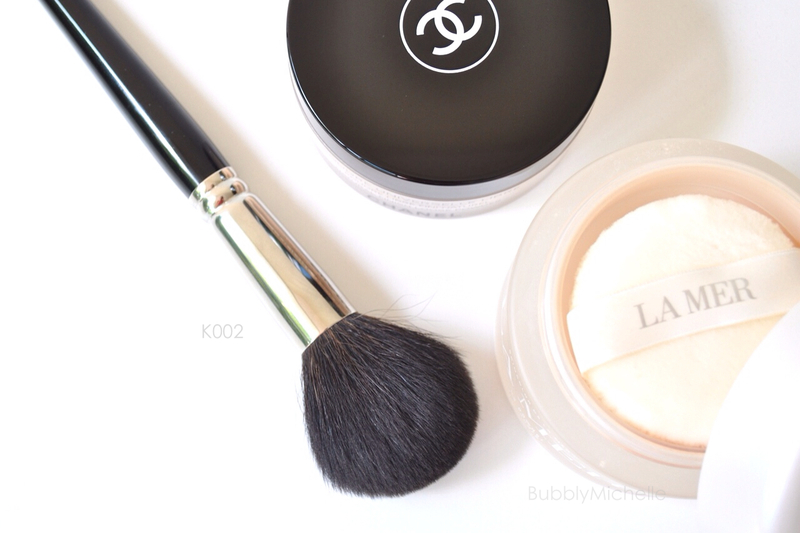 P.S – It’s also a nice size and shape for softening your contour and blending. 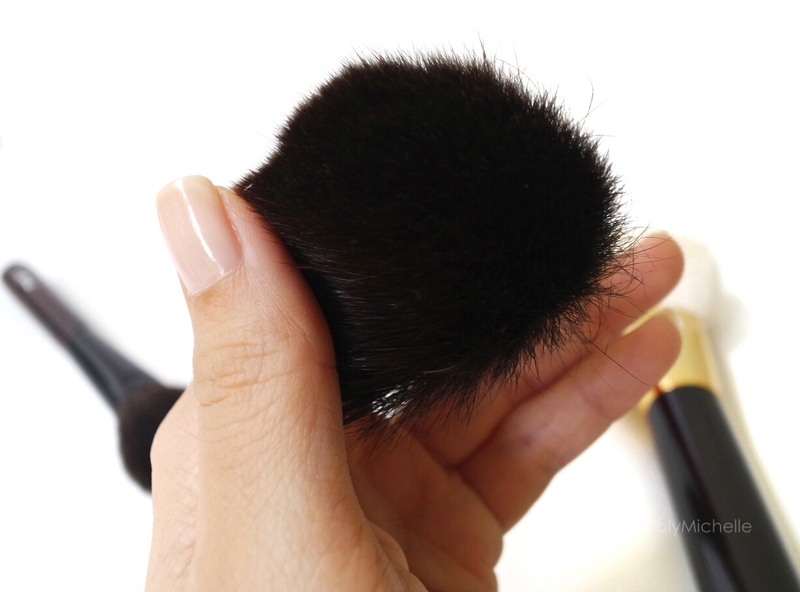 So if you do contour your face everyday, you’ll enjoy this multi purpose brush very much. As with all my other brushes I wash this every two weeks or so since I use it everyday. I never noticed any colour bleeding but have experienced slight shedding every once in a while. 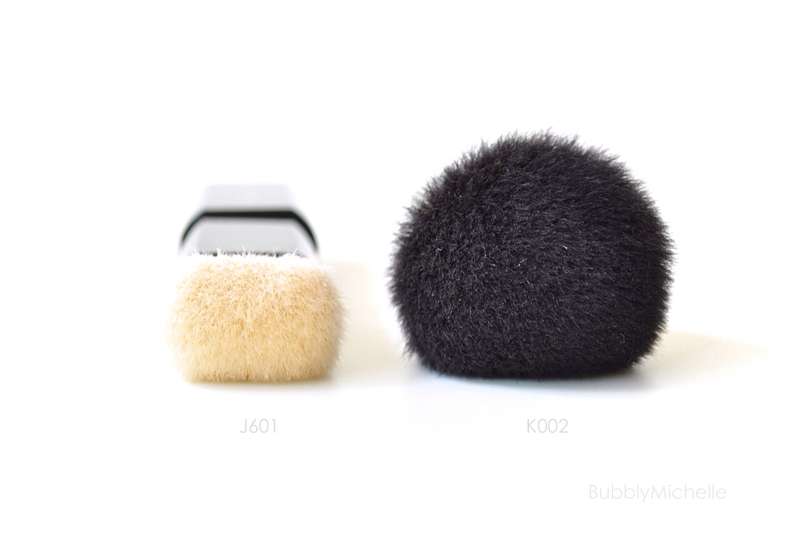 Additional Info – If you’ve owned a tapered brush before you’ll know that it can ‘fluff up’ after the first wash. They don’t look as sleek as when it arrived. The best way to retain the shape is to put them in a brush guard to train the bristles to stay in their initial form. I obviously don’t do this and have no problems with my brush looking puffy. It doesn’t really affect it’s performance in this case. But I do shape the bristles into a point before I lay them down to dry. 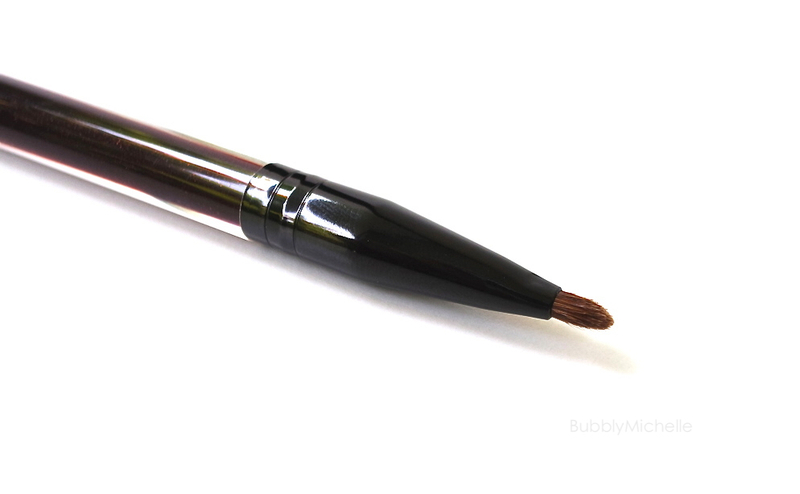 This is a densely packed, stubby brush with a small pointed tip. Perfect for pin point concealing. 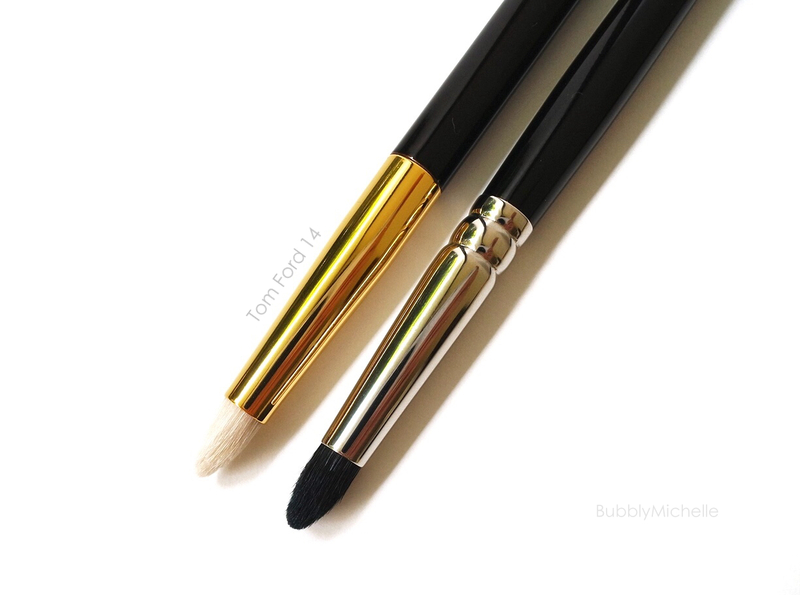 I came to know about this brush through a Lisa Eldridge video and have found it rather lovely. The dense bristles allow great control and lets you conceal tiny acne spots or discolouration easily. The brush handle of the KA is a hard acrylic and very durable. Almost feels like holding a pen. I use this with a cream concealer. Just dab it right onto the blemish and soften the edges by tapping it with my finger. 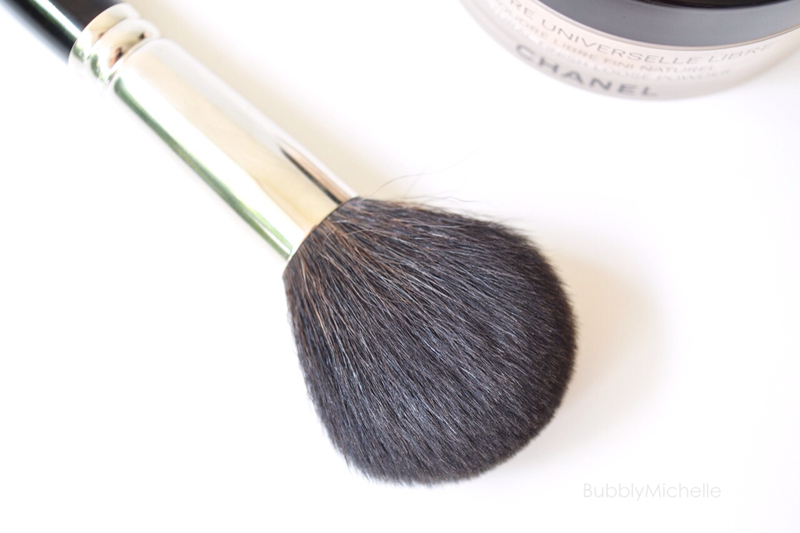 As far as spot concealing goes, this brush is ideal. It doesn’t have much give and remains firm, so the application is very precise. 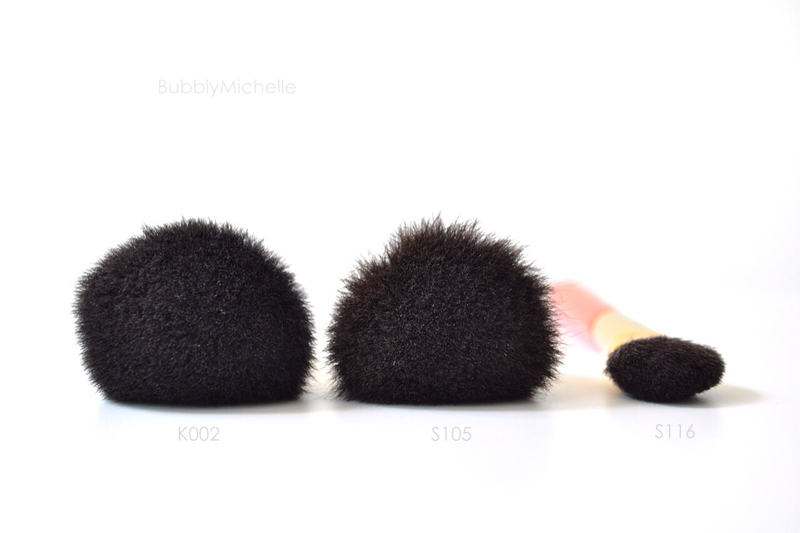 Is a round, medium sized flat eyeshadow brush made of goat hair. The bristles of this is perfectly shaped to follow the contours of the lid to apply eyeshadow effortlessly and precisely. 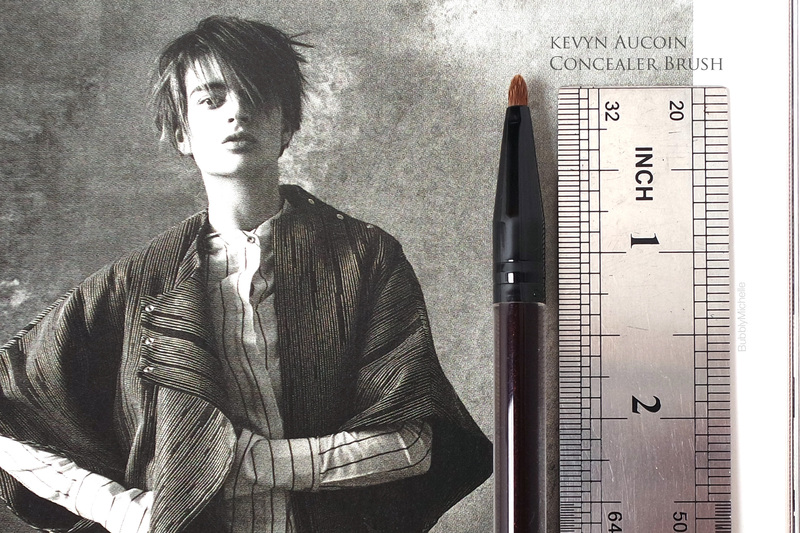 What’s special about this basic flat eyeshadow brush is the size. I found it difficult to zero in on a nice medium sized brush as everything I had in my stash were slightly too big with much longer bristles. However this one is perfect for steady application as the larger brushes are too clumsy for precision jobs. I also noticed this particular flat brush retained it’s shape well without the bristles getting unruly or fluffing up after a wash. I use this mostly with wet eyeshadows (such as the NARS Dual Intensities) to create an intense lid. Just load the brush with eyeshadow and pat to pack on the colour. I find the size is just right and should be perfect for those with hooded eyes or smaller eye lids. 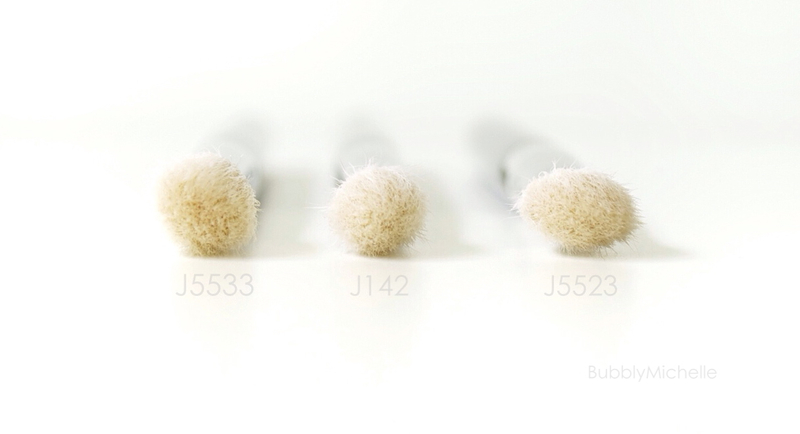 Additional Info – Hakuhodo brushes from the J series are all made of natural bristles that are not dyed. So they always maintain their original colour, be it white or brown without any colour bleeding. It’s why I always purchase brushes from this particular range. 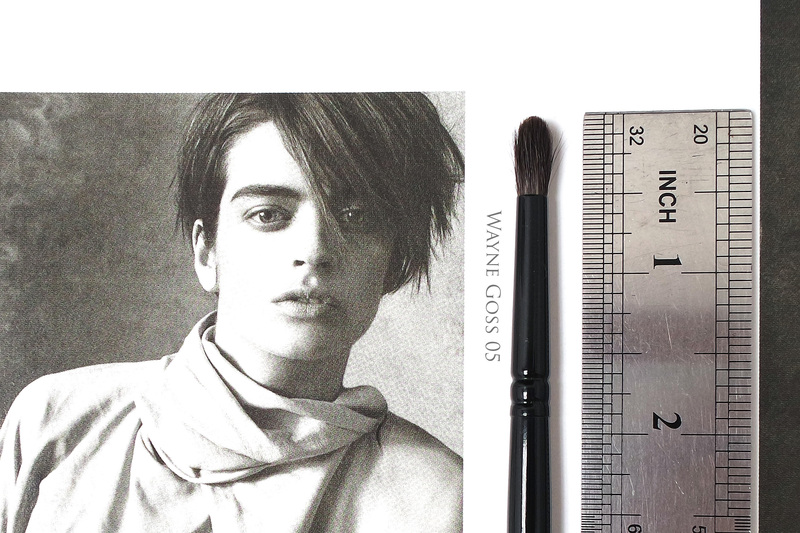 Is a small, tapered crease brush with a rounded tip. The bristles are natural hair and very soft. They are also uncut which means they won’t feel scratchy when used on the lid. I personally love the smaller size of this, and the density and length of the bristles allow just the right amount control while remaining flexible. Perfect for blending out harsh edges. 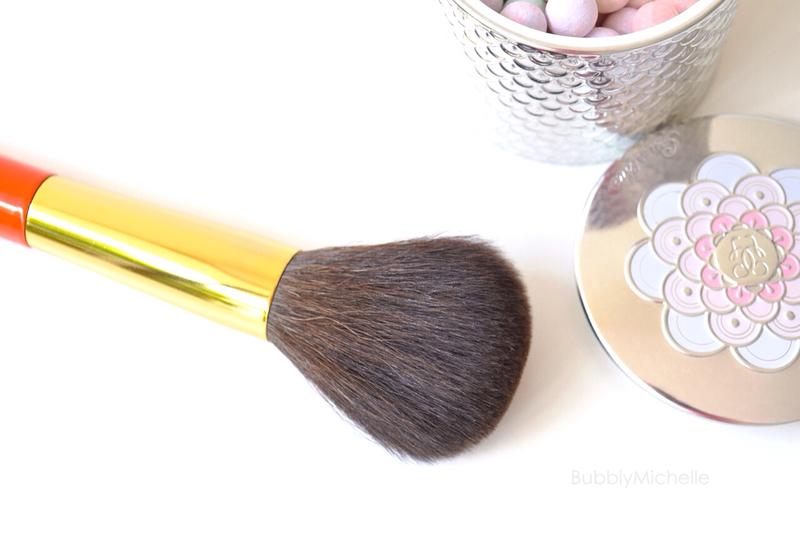 You can even use this to do a very defined crease as this brush gets right into the socket. It also excels in blending out small areas such as diffusing out the edges of a cut crease or smoking out liner keeping close to the lash line. 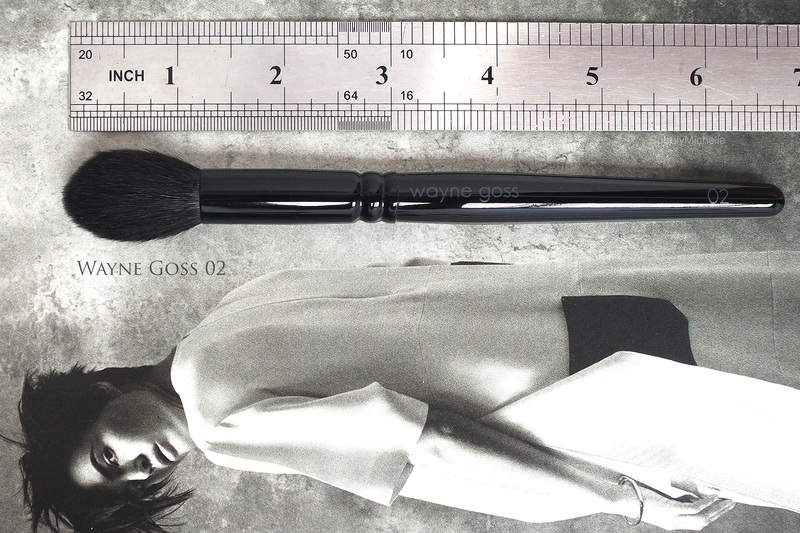 The Goss 5 is a unique brush and overall I am extremely happy with it. So far it has never shed and always retains it’s shape after each wash. I think I need another one in my life. One of the best eye brushes I have ever come across. 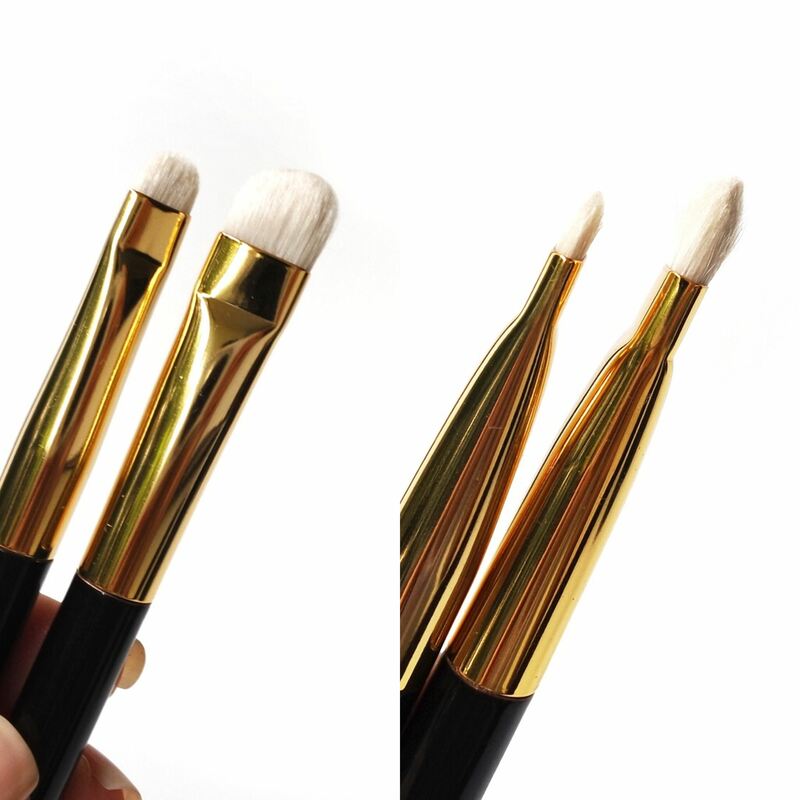 Is a rounded, dense liner brush with a very fine tip. As far as eyeliner brushes go, I find this to be unique. The well packed, short bristles allows maximum control and a stiff edge for smudging out liner easily. The thin edge also allows to smudge very close to the lash line (upper and lower, both) and define the eyes well. It’s one of the most frequently used brushes in my stash. I plan on purchasing another since I use it so much. Made in Japan. Retailing at $52. Is a round brush with an angled tip. It looks like someone chopped off the upper half at an angle. This brush is very densely packed and has little flexibility. Regardless of the sharp flat edge the brush feels very soft on the lid and never scratchy. I use this mostly to blend out any stubborn hard lines of a smokey shadow look. Just place the angled edge of the brush along the eye contour and swipe back and forth in a windshield wiper motion. It’s that easy. Is a medium sized crease brush. I find the bristles of this much softer than the TF Blending Brush which is downright scratchy in comparison (and why I didn’t include that brush in my top 9). The brush allows for good flexibility while maintaining just enough resistance to blend eyeshadows in the crease. 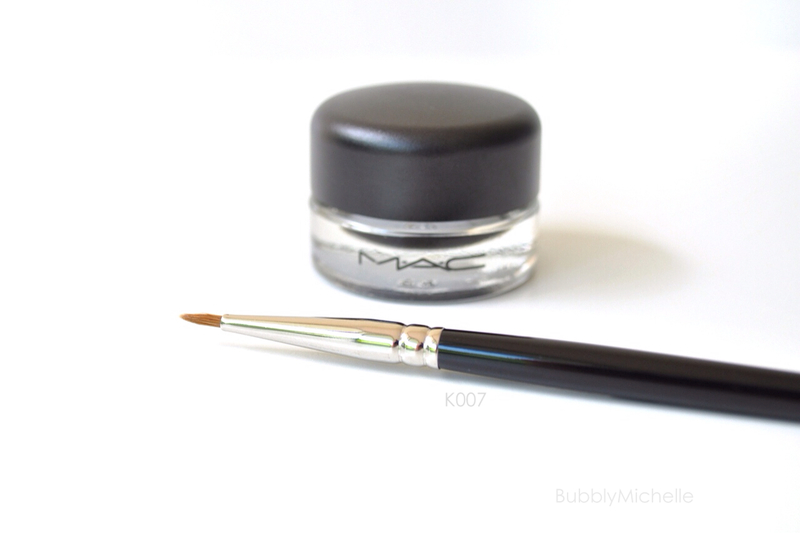 The rounded fluffy brush tip allows for general colour placement and blending both. Making it a versatile brush for daily use. I already have three and also purchased several as gifts for friends. 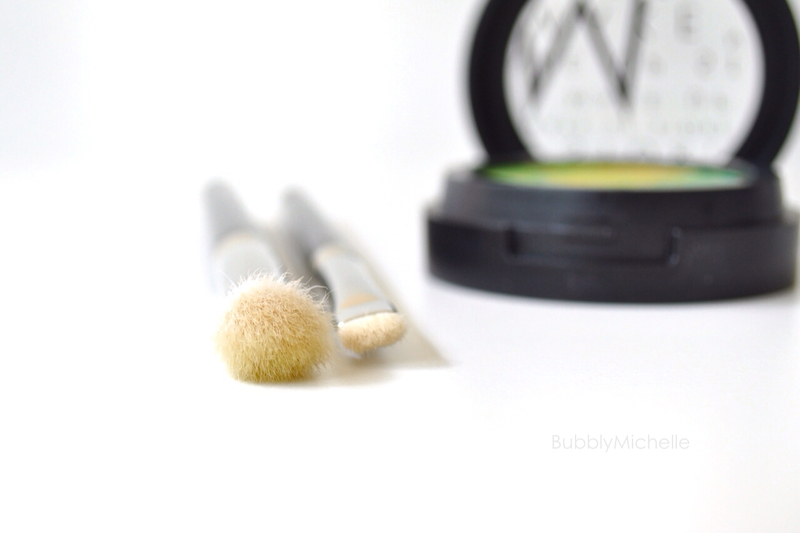 If you are just starting out on your brush collection, this is an excellent brush to invest in. The quality is top notch (as all the brushes I’ve included here) and will last you very long if looked after. Plus, it’s very budget friendly. Is a tiny duo fiber fan brush. It’s the only brush I’ve included which has synthetic bristles. The brushes main purpose is to separate and define your lashes while removing any unwelcome clumps of mascara with ease giving lashes a natural fluttery finish. Simple, you just place the brush at the base of your lashes and wiggle and comb out. The synthetic bristles allows the brush to retain it’s firm fan shape while also extending it’s durability as most mascaras tend to be waterproof and are difficult to cleanse off. This brush cleans easily though with a regular brush soap and dries fast. That concludes my post on the Top 9! However I’d like to leave you with some additional info on brushes, questions some of you have asked me on Instagram. I hope you find this useful as well. The most frequently asked question is what my favourite brush brand is. It’s Hakuhodo. I love that the quality is great. 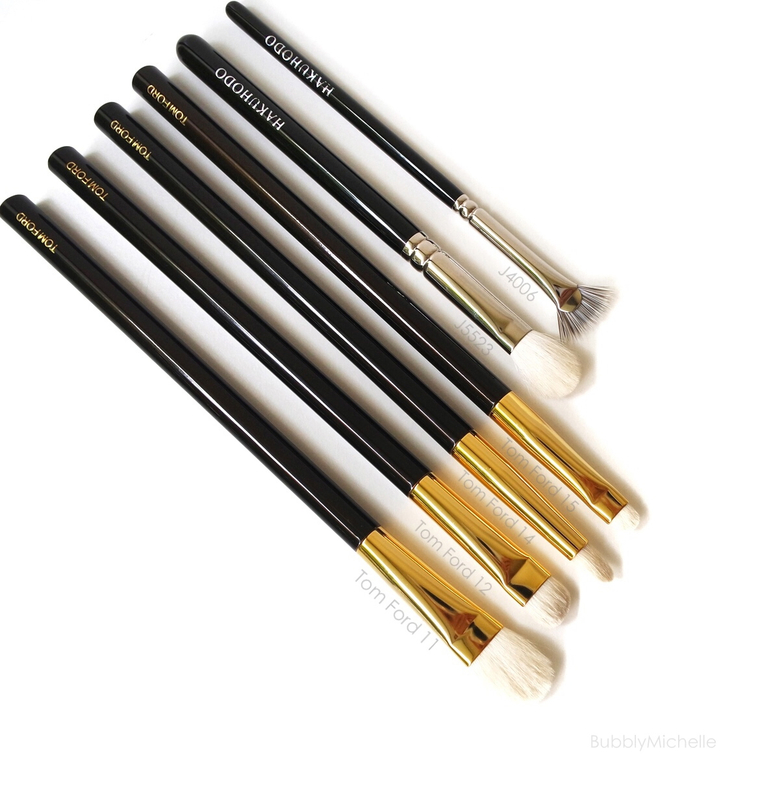 The brushes are long lasting and are priced very competitively. I feel that artists in particular who are looking to expand their brush collection would benefit a lot as the selection of brushes Hakuhodo carries is just mind-boggling and they have a brush for virtually EVERY need imaginable. Another FAQ is what I use to clean my brushes. There are special soaps meant specifically for brush cleaning. Some brush companies carry their own soaps but also artistry brands such as Make Up Store make a great one as well. So far, I’ve tried the Hakuhodo soap and the Make Up Store one. Both equally good. For those of you with no access to purchase a brush soap, just use a baby shampoo and luke warm water. It works well. Occasionally I use my facial cleanser (a gel one) too as it’s very mild and doesn’t dry out or damage the bristles. Of course that’s an expensive option. But I don’t mind, as I only need a teeny tiny bit to wash my brushes. And to be honest my brush collection consists of mostly high end natural fibre brushes which require very gentle cleansing! So there you have it, lengthy ramble about brushes. If there is any additional information you’d find helpful, please feel free ask me in a comment, I’ll answer them asap. I’m also planning on doing a post on a brush starter kit for those of you new to makeup brushes, so if you are keen on something like that, let me know! Welcome to yet another post on brushes. This one’s a bit different though, as these are brand new from my little Hakuhodo pop up store visit visits. So today I will be sharing first impressions and doing a few comparisons with my existing Hakuhodo brushes. The H2282 from the premium Kokutan series is a true masterpiece! I adore the wooden handle with it’s soft curves and the beautiful Japanese lettering, such an esthetically pleasing design. 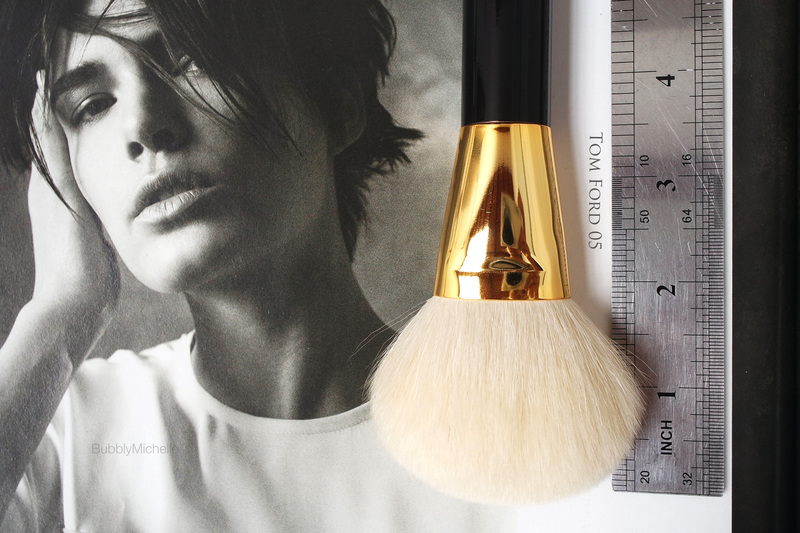 Looks aside, the brush feels luxurious to the touch. This is without a doubt the softest brush I own (softer than my Chikuhodo Z4!). Crafted with a mix of blue squirrel and synthetic fiber the brush is of a flat paddle shape, with tapered head leading to a soft curved edge. This helps with applying blush with no visible edges. 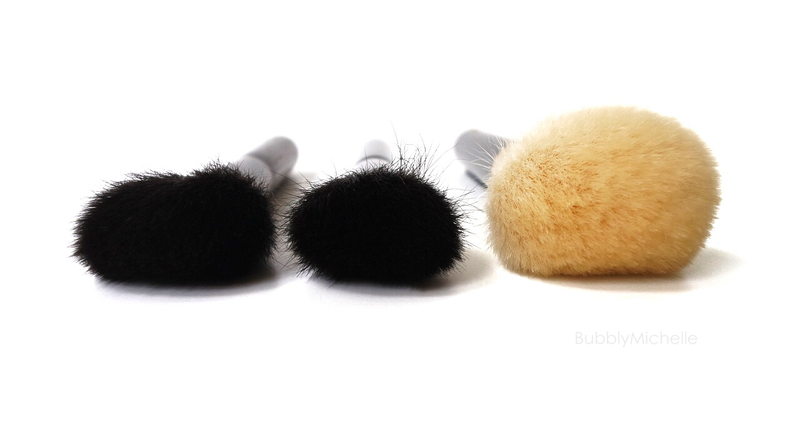 The medium density of bristles picks up just enough blush to create a soft flush. 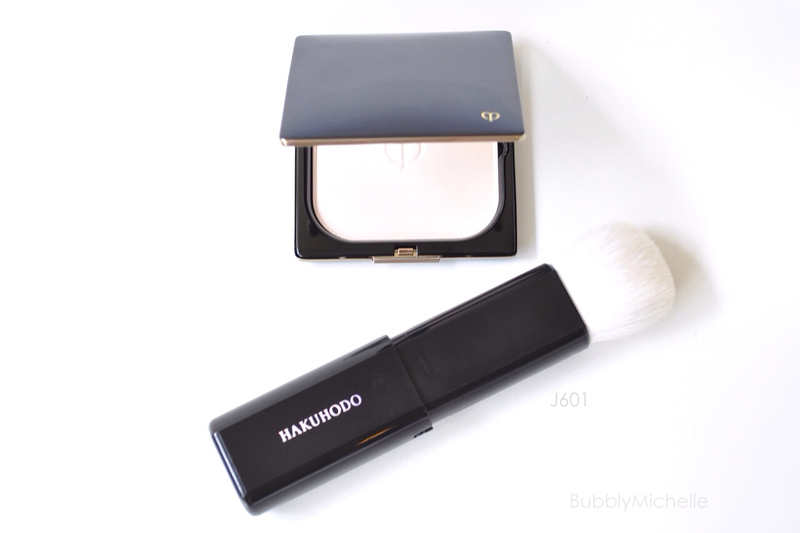 Although the J4003 brush is listed for highlighting on the Hakuhodo site, I was recommended using it for contour as it’s small enough to work well with my face shape. Bristles are somewhat tightly packed and aid with good control and resistance while you carve out chiseled cheek bones. J4003 is crafted with goat Hair. 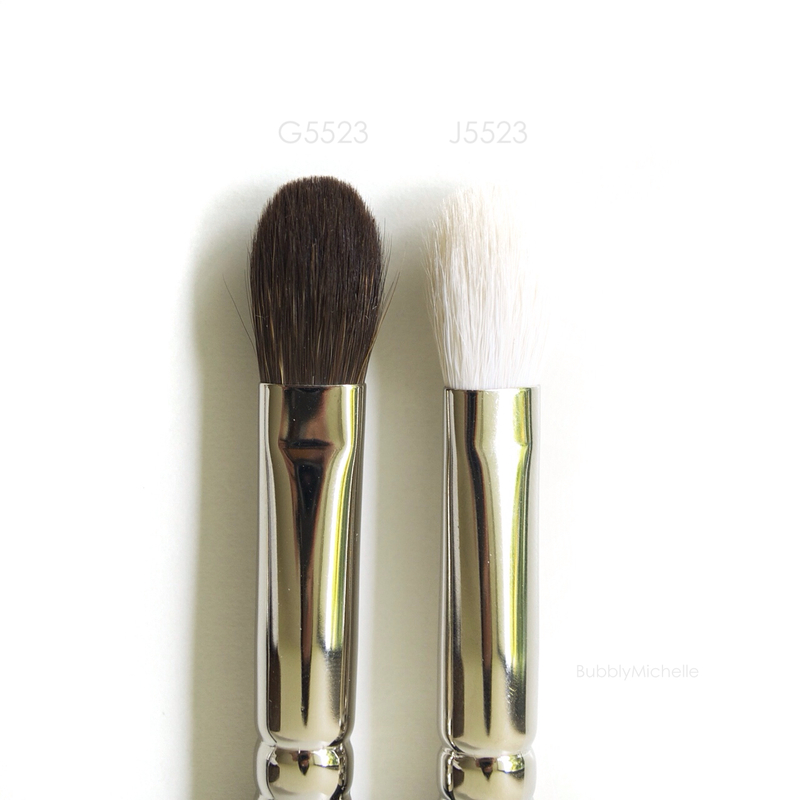 G5552 finally filled the void in my collection for a cream blush brush. It’s crafted with a blend of Goat and synthetic fiber and the polyester bristles that extend a little higher than the goat hair is said to give the brush a more springy feel and aids in stippling and buffing cream/liquid products without over applying. Now onto eye brushes. 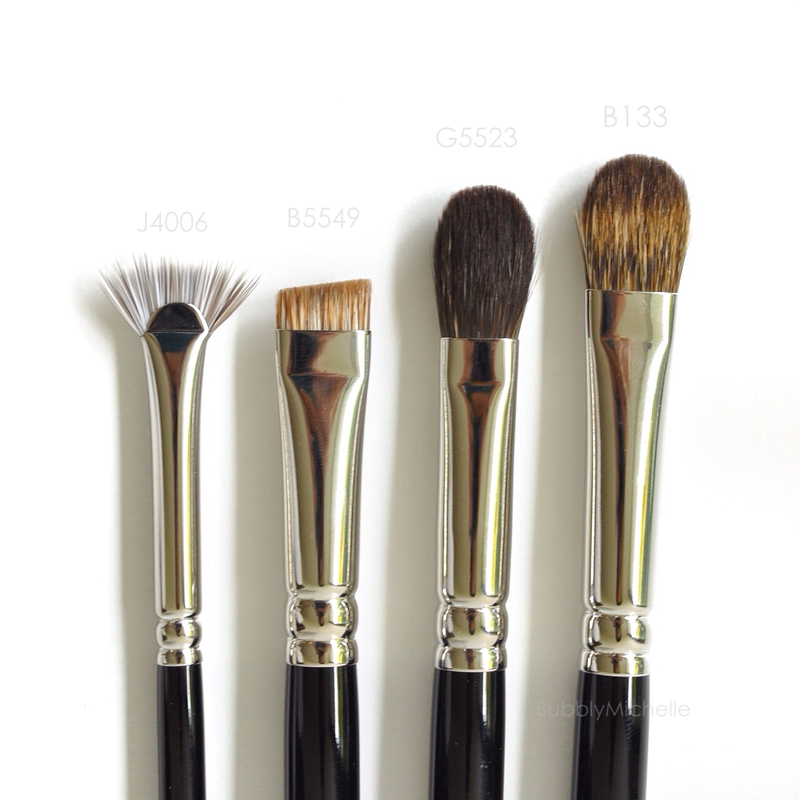 Below are a selection of blending brushes that I picked up. 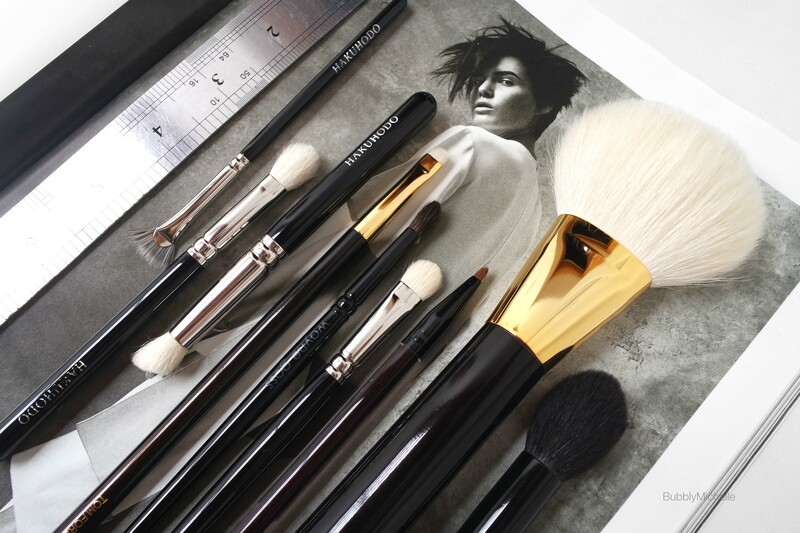 As you would have probably guessed, my favourites from the Hakuhodo brushes are the J series. To me the biggest selling point is that the bristles used to craft these are pure and have not been dyed. And what’s not to love about the contrast of pretty white bristles against the glossy black handles! Looks so elegant and professional. 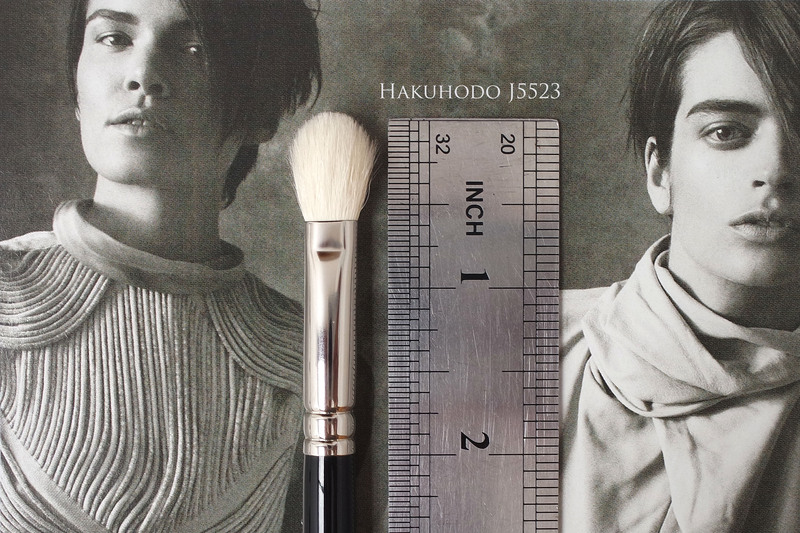 So I picked up 2 more of the J5523 which is one of my favourite Hakuhodo brushes. You can read more about this brush over here. I then picked up the J142. 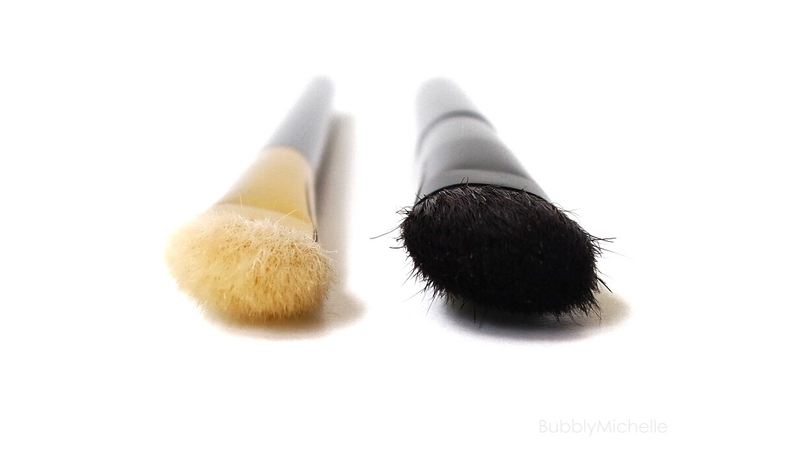 A slimmer and longer blending brush (compared to J5523) with soft tapered bristles that lead to a slight point. 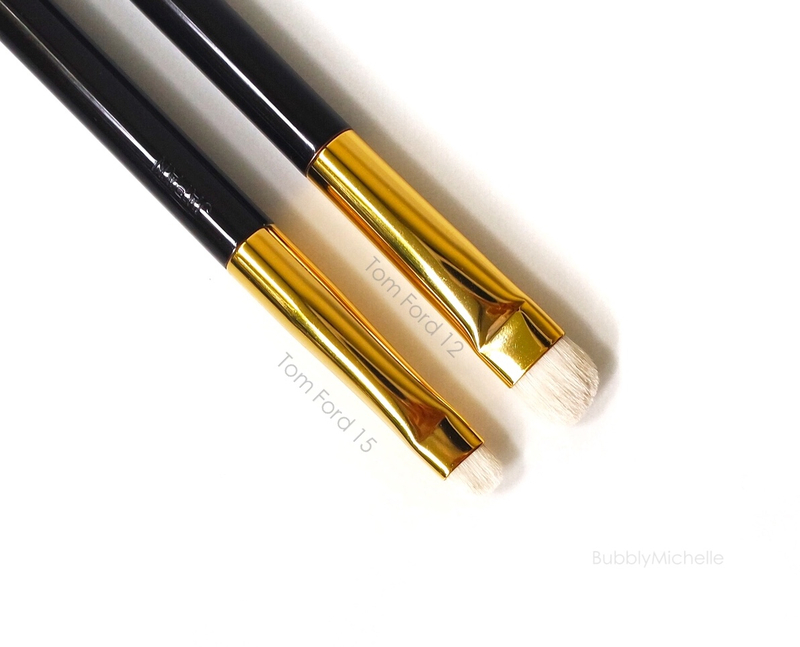 This one looks like a scaled down version of my Tom ford eyeshadow blend brush. And since I love my TF brush so much, I decided to pick this up to see how it measured up against it. My last pick, the J5533 was an impulse buy. When I stroked it (for lack of a better word) I realized this brush had more resistance than the J142. The tapering of the end was very very slight leading to the brush head looking almost flat when view from above. Not sure as to what this shape is ideal for, but I am guessing it would be great for blending. 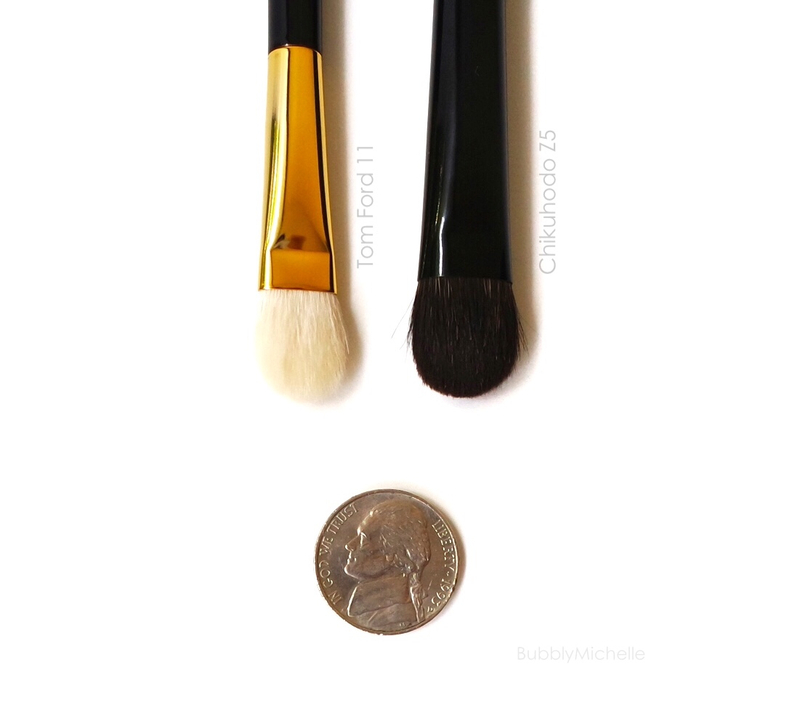 Here’s a look at the brush tips for size and shape comparison. 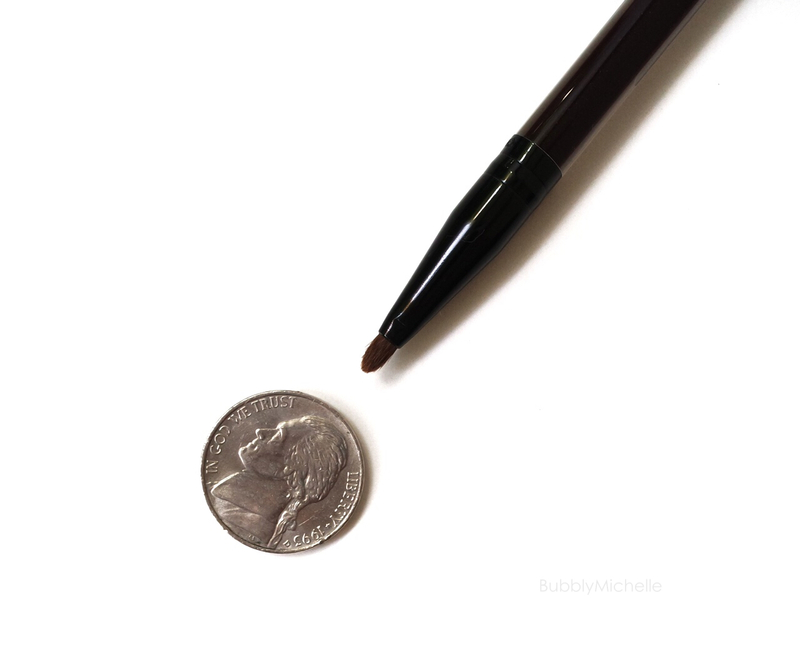 J142 has the smallest tip and is rounded, great for defining crease and blending. The J5533 is slightly larger and suitable for larger eyes. 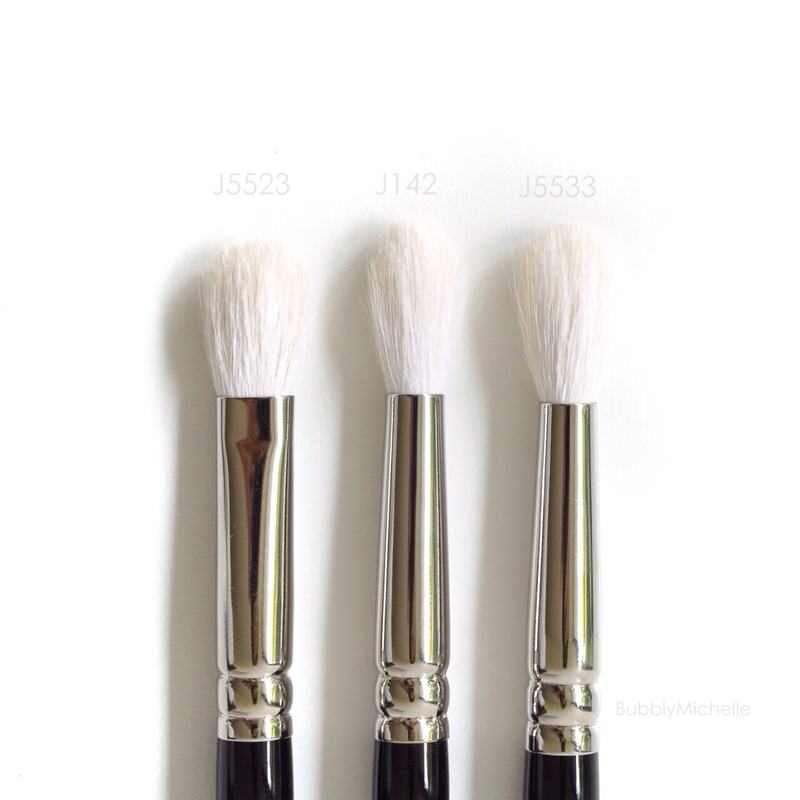 J5523 is a flatter brush. 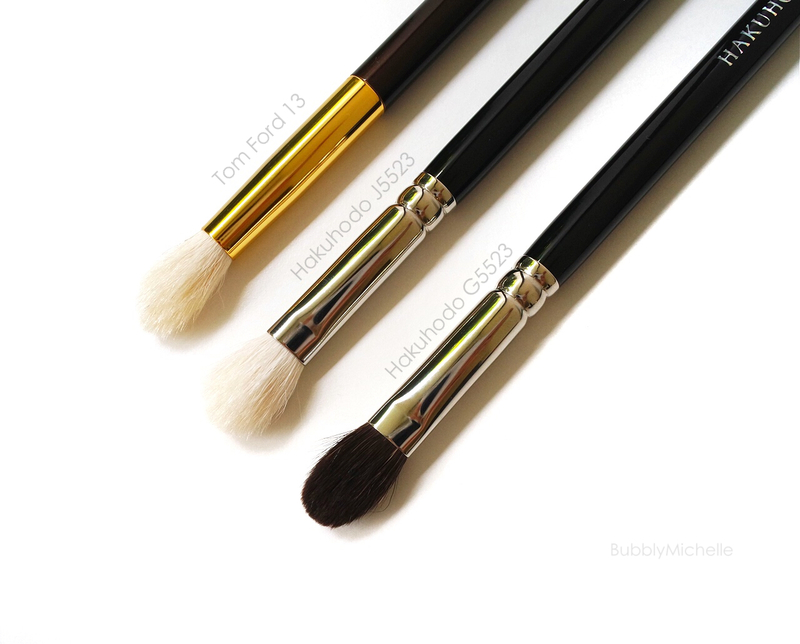 For a quick comparison I also snapped a few of these blender brushes with my Hakuhodo S142 . *On a side note, as you may have noticed, when the numbers remain the same (in this case J142 and S142) with only the series changing, the shape of the brush stays identical. Only difference being the type of hair used to craft it or the handle. Now let’s move onto some interesting brushes I picked up. First one is this very unusually shaped fan brush J4006. There is a bit of a story behind this, so I thought i’d share. So the first time the Hakuhodo pop up stall made an appearance in Takashimaya I spotted this little brush. 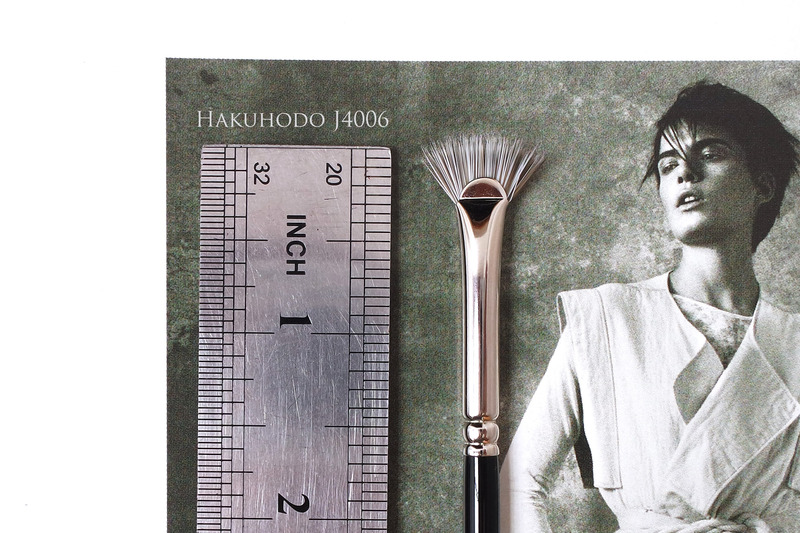 It’s possibly the smallest fan brush I had ever seen, out of curiosity I asked one of the Hakuhodo representitives that were present as to what it’s uses were. Apparently it’s for taking off excess mascara and clumps and also separating the lashes! I walked away as it was not a brush I needed but then as always, I went back a few day’s later to find they were all sold out! >.< Anyhow glad I found it again! And this time, wasn’t going home without it! The third brush was a bit of an indulgence.. G5523. This is the softer version of my J5523 and is made of blue squirrel hair. Due to it’s softer bristles it gives less resistance than the J5523 and also note that the bristles lie much closer together. Here’s a close up of the two for a quick comparison. The last brush B133, is one of the few Canadian squirrel hair brushes that Hakuhodo makes. Canadian squirrel hair is rare and expensive, and it’s said to be very elastic and yet soft to the touch. It’s one of those luxury brushes that are nice to own 😀 And according to the Hakuhodo site, I read that this brush was highly prized by makeup artists for it’s uniform body and control. So I am excited to give this a spin! And there you have it! Everything you needed to know about my hauling session and then some! Hope I didn’t overload you with info 🙂 And please feel free to leave a comment if you have any questions about these brushes. Welcome to a much requested post on brushes! Although this is not a review on my entire collection, just wanted to share with you some of my most reached for Hakuhodo brushes and which products I pair them with. 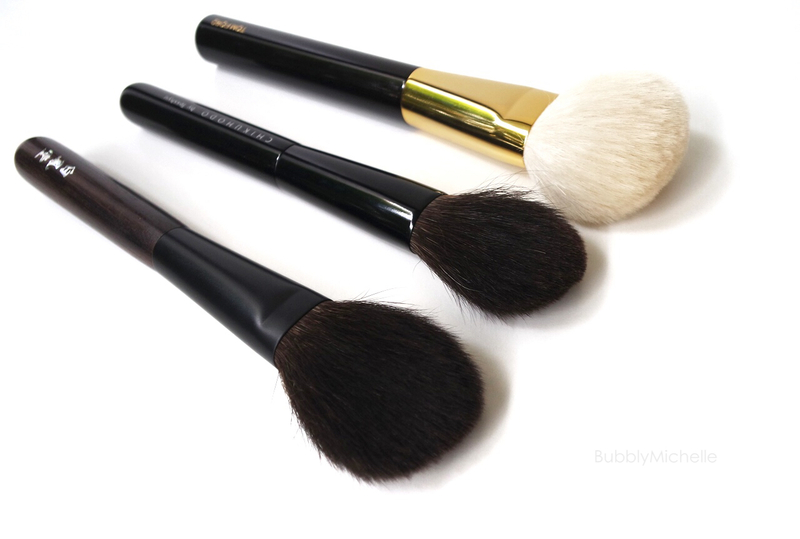 Without wasting time (since this is a lengthy post) let’s get right to face brushes. 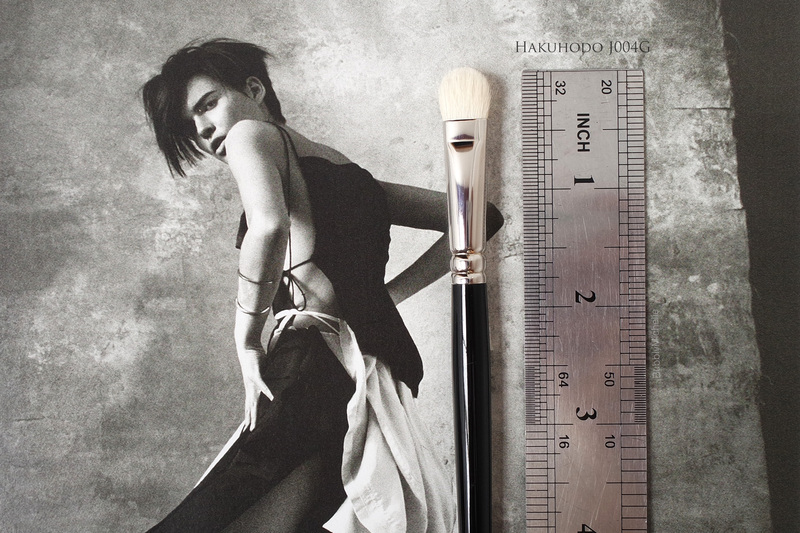 The K002 is one of the very first Hakuhodo brushes I purchased. It’s a brush of medium density, very soft and works really great with loose powders. One thing I love about the K series is that the handles are long and I find I have more control while applying, specially when a brush is used on a larger surface area like the cheeks or face. If you look closely at the brush (below) you’ll notice the bristles are fluffed up, although when I purchased it, they were more tightly packed.. *a good thing to keep in mind when purchasing them is that they do ‘expand’ or fluff up a bit after one wash. 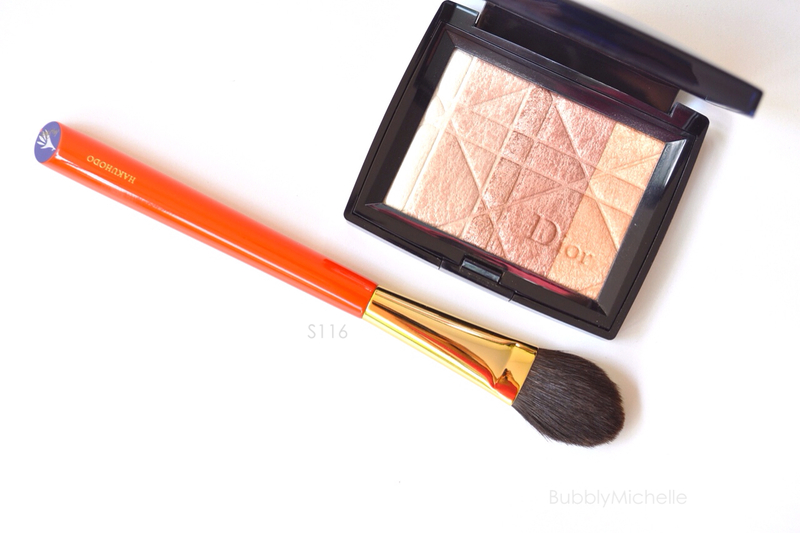 This next brush is something I keep exclusively for use with my Guerlain Météorites, the S105. 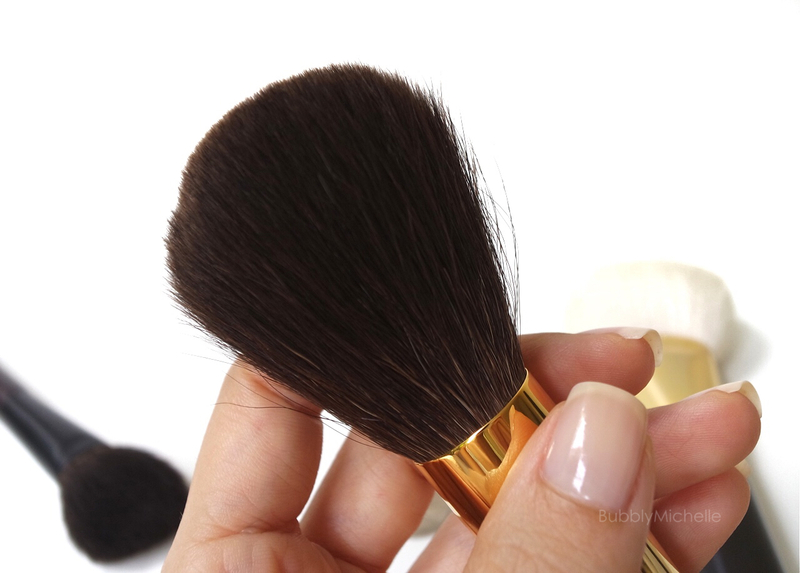 Now I am not saying you need to own a separate brush to use with finishing powders, your regular powder brush will do. But this is just my preference. So the S105 is crazy soft and has considerably low density compared to my powder brush. Reason being I don’t want a heavily saturated brush dumping a load of finishing powder on my face all in one go. I also love that the extra soft bristles add a luxurious touch to the last step of my makeup, making it almost therapeutic. Here’s a close up of this soft little thing. This one is a low density flat brush with a slight point. It’s tapered end picks up product sparingly and deposits just the right amount of highlighter on the high points of your cheekbones, bridge of your nose (this is where the point comes handy). 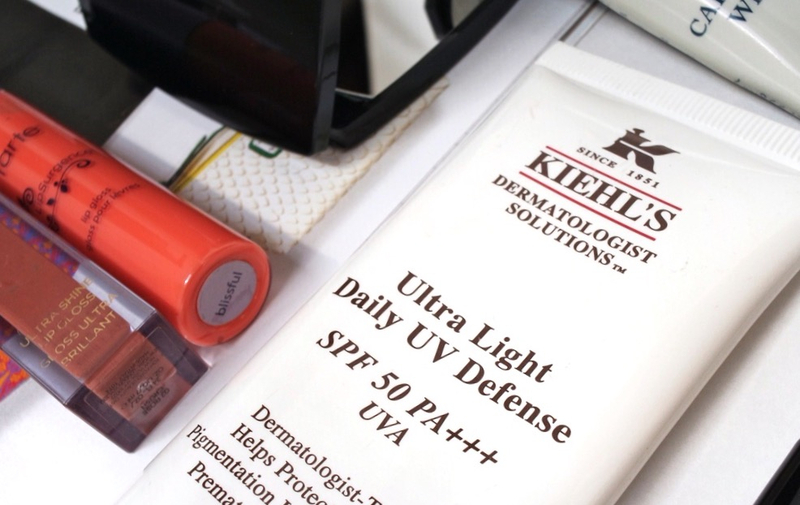 I also find the size just perfect too, great for working on smaller sections of your face. So that rounds up my list of favourites for face brushes, let’s take a look at the density and formation of the bristles. 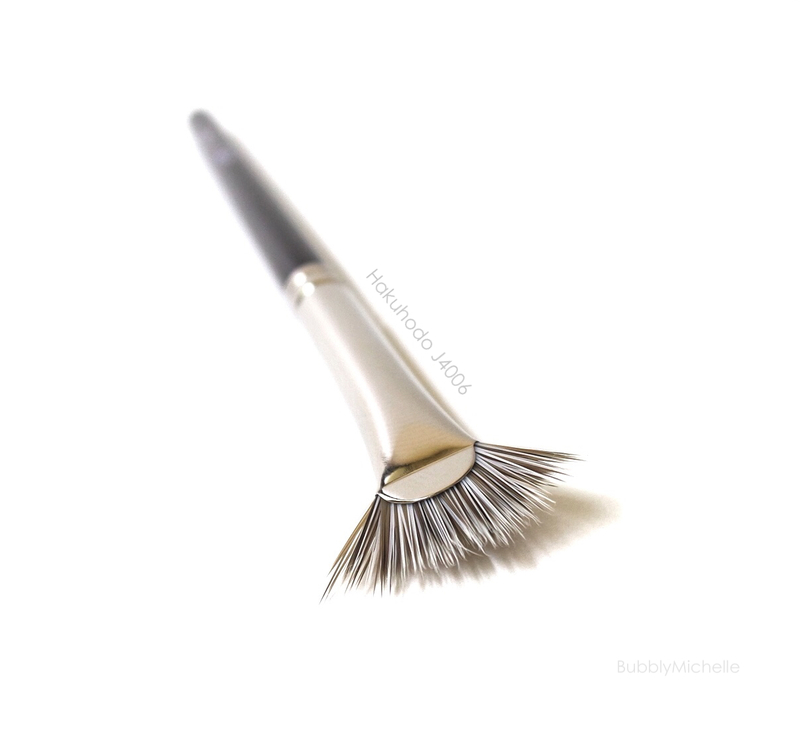 For on the go touch ups my favourite is this retractable brush J601 which is made of goat hair. 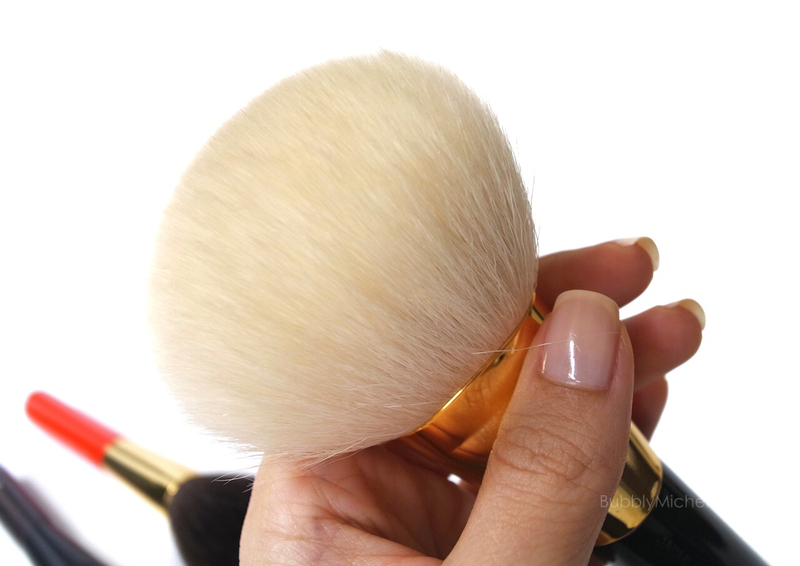 Although goat hair is not as soft as blue squirrel, this brush is good enough for a quick touch up, be it blush or pressed powder. I love retractable brushes for travel since they are hygienic and don’t mingle directly with the contents of your makeup bag. Everything stays nice n clean. Below is a little comparison between my regular powder brush and the touch up brush for your reference. Now on to eye brushes. I absolutely love how Hakuhodo makes a mind boggling selection of these.. from all sizes and shapes in various types of bristles! I definitely had a hard time deciding which to purchase. 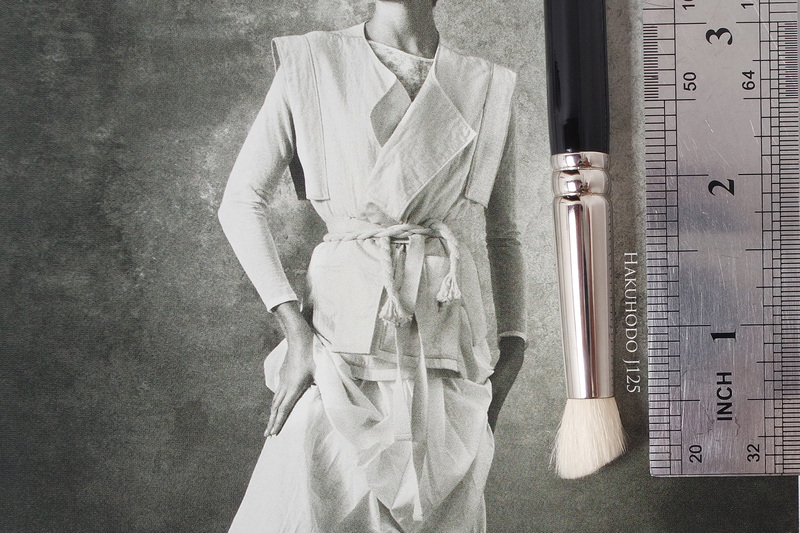 So let’s start with one of my favourites, the iconic J5523 brush which is of soft goat hair. Famed for being the better sister of the Mac 217 this one is a multitasker. You can use it for packing on eyeshadow to the lid, or to blend out any harsh lines and soften the crease. It’s truly amazing. Although I took a while to add this to my stash, I am so glad I finally did. 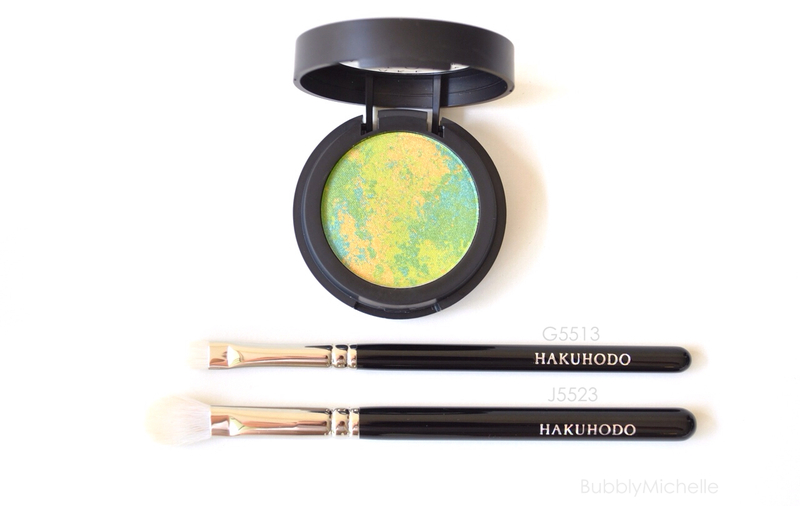 If you buy just one Hakuhodo eye brush, i’d recommend you make it this one. Now the other tiny brush beside it, is my highlighter brush for the eyes G5513, it is small enough to get to my tear duct without stabbing me in the eye and also works perfect with tricky eyeshadows like the one shown above where you can individually pick colours (lets say I just wanted the yellow from this pan). It’s always good to have at least two different sizes of brushes to work with 🙂 So don’t just buy one! below is a pic which shows size, shape and density between the two. The next brush is my HG liner brush.. actually Hakuhodo makes several of these very fine pointy brushes. I absolutely love how thin I can draw my liner with this. It’s perfect to use with my Mac Blacktrack gel liner ❤ and the tip is the ideal length (not too long that it sacrifices control). Onto another lovely S series brush. 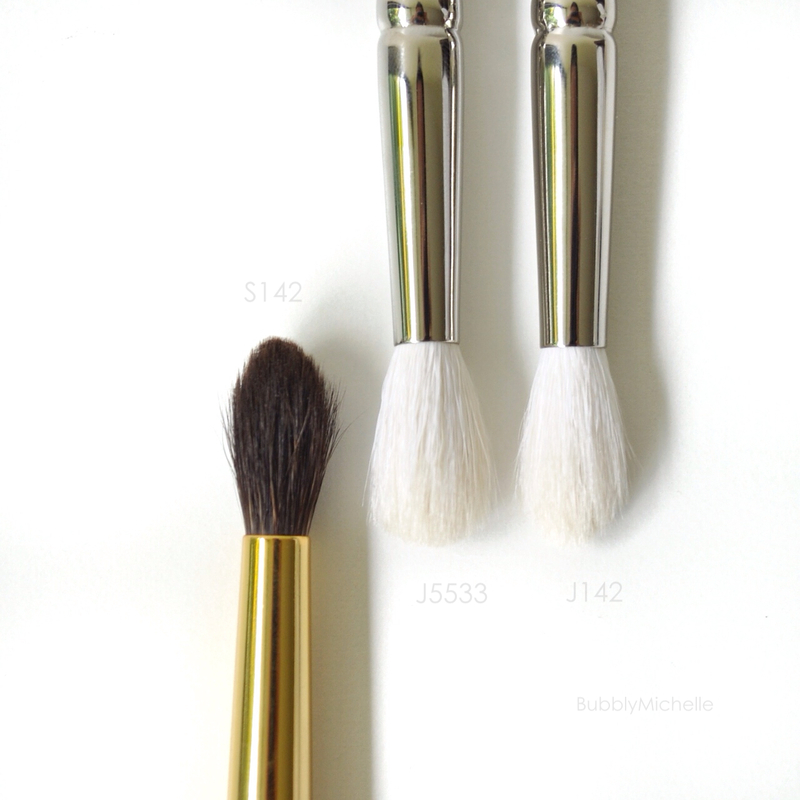 S142, a must have blender brush made from the softest blue squirrel bristles. I love how flexible it is, and the soft bristles promise feather light strokes every single use. I actually use this to set my under eyes with powder. The pointy tip helps me get right under my lower lashes with minimal effort and the soft bristles are great for working on delicate under eye skin without dragging it. 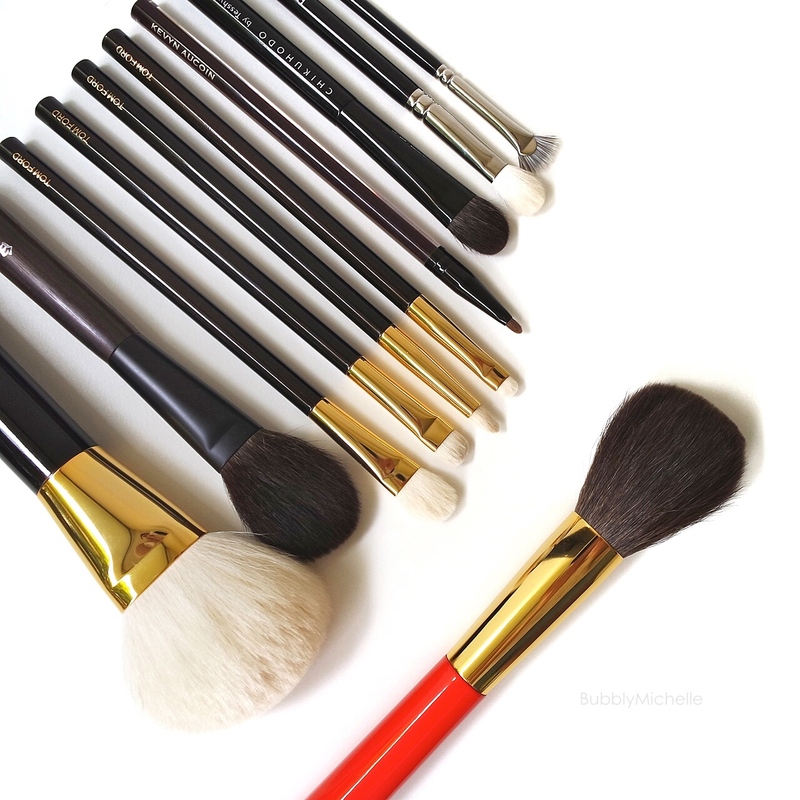 So concluding this post, I just want to say that these are brushes that I find best suited for my needs, which may vary from yours. You can purchase Hakuhodo brushes online from their site, and if you are residing in Singapore there is a pop up store at Takashimaya (Beauty department- level 1) from the 27th March – 8th April. Go as early as possible so you get to see the entire range 🙂 Most of the popular brushes sell out early!